Money, Time, and Tactics: Can Games Be Effective in Schools? If it's true that 97 percent of teens in the U.S. are playing digital games, then the focus on how games can fit into the shifting education system becomes that much more important. Schools, districts, and individual educators are trying to figure out how games and learning can fit into the current complicated landscape. The newly released report Games for a Digital Age: K-12 Market Map and Investment Analysis, released by the Joan Ganz Cooney Center and the Games and Learning Publishing Council, describes the many different criteria in play in detail, including obstacles from the policy standpoint, lack of teacher development, as well as how the Bring Your Own Device movement is influencing the push towards games and learning. Though it's well worth reading the report in its entirety, below are excerpts pulled from the report, conducted and written by Dr. John Richards, Leslie Stebbins and Dr. Kurt Moellering. The school day is divided into class periods, and this division limits lesson length. Furthermore, the combination of standards and the scope and sequence tied to core curriculum create “coverage” requirements that place practical limits on the number of lessons that can be devoted to a single topic. Nearly all games fall clearly along a continuum ranging from short-form to long-form with a critical distinction and a bi-modal distribution pattern based on fitting in a class period. As noted by Rob Lippincott, Sr. Vice President of Education, PBS, “Games don’t fit the time box of a class period; a game succeeds when it is sticky and gobbles up more time. You want games in school to finish quickly and speed up learning.” (CS4Ed interview, April 2012). We placed games into these two time-based categories, short-form and long-form. Within these broad areas fall dozens of different kinds of games, ranging from three-minute apps to open, immersive Multi-User Virtual Environments (MUVEs) that involve lengthy game playing. In addition to the length of play, the mechanics of a gaming experience varies broadly, with simple “add-on” gamification-type reward systems falling typically at the short end of the time continuum, and more complex, multiple-path, role playing games falling at the long end. In longer-form games, the game mechanics are typically intrinsic to the learning experience rather than placed at the end of or external to the game play itself. In most K-12 schools the day is organized in blocks of time that average 40 minutes or less. Transition time and time for instruction or discussion connected to curricular material frequently leaves only 20 to 30 minutes for actually using a learning game. 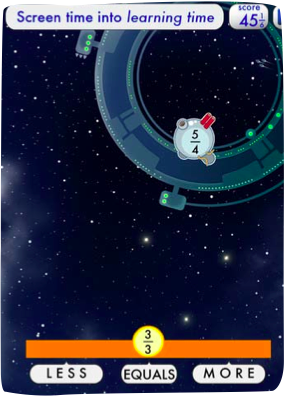 Short-form games are interactive digital activities that fit within a single class period and have some components common to all learning games. They focus on a particular concept or on skill refinement, skills practice, memorization, or performing specific drills. Successful short-form games meet an important and defined market need, whether it is by demonstrating a concept to the whole class on an interactive white board, or by providing individual students with practice on a specific concept or skill. Short-form games include drill and practice, brief simulations, visualizations, or simulated training tools, and different types of “game-like” interactive learning objects. These types of games have the potential to be embedded in personalized learning environments or adaptive engines that combine data and feedback loops that are becoming increasingly popular in schools. This type of game product is starting to gain traction in the K-12 market, due in part to its alignment to standards and to extensive product lines that cover many topics within the curriculum or meet an important, albeit narrow, market need. Teachers find such games easy to access and understand, and the games fit neatly into the short blocks of time available in the structured school day. 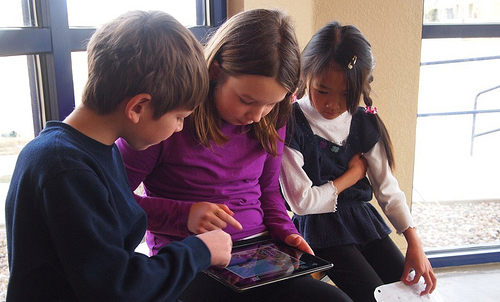 Long-form learning games extend beyond a single class period. Typically game-playing is spread over multiple sessions or even several weeks. Long-form games lend themselves to the development of 21st century skills such as critical thinking, problem solving, collaboration, creativity, and communication. Kurt Squire, [co-founder and current director of the Games, Learning, & Society Initiative] underlines the distinction between the sophisticated learning skills developed through immersive experiences versus games where students are rewarded for memorizing vocabulary words or performing math drills. Squire views games such as Civilization III as having the potential to push students to engage actively in problem solving, reflection, and decision making related to historical and political situations (Squire as quoted in Klopfer, Osterweil, Groff, & Haas, 2009). Other researchers concur, and view long-form, immersive game play as a critical factor supporting a broad arena of social and cognitive learning (Shaffer, 2006; Bogost, 2007). A number of individual studies have demonstrated that specific long-form games perform better when compared to typical lectures. Examples from research studies include Supercharged!, an electrostatics game that showed a 28% increase in learning (Squire, Barnett, Grant, & Higginbotham, 2004); Geography Explorer, a geology game that showed a 15 to 40% increase in learning (McClean, Saini-Eidukat, Schwert, Slator, & White, 2001); Virtual Cell, a cell biology game that showed a 30–63% increase in learning (McClean et al., 2001); and River City, a game that showed a 370% increase in learning for D students and 14% increase for B students (Ketelhut, 2007). Recent research also points to the significance of the engagement factor produced by long-form learning games. Engagement fosters motivation and keeps students involved in the learning experience. While many educational software products have focused on extrinsic rewards for skills practice, longer form games where game play and learning are closely connected have been proven to be even more engaging than following a learning task with an external reward (Habgood & Ainsworth, 2011). "When researchers argue that learning games are efficacious, promote critical thinking, and engage 21st century skills, it is not necessarily clear that these conclusions apply to many shorter forms of learning games." The authors of a report issued by the Committee on Science Learning at the National Research Council concluded that simulations and games have great potential to improve science learning in the classroom because they can “individualize learning to match the pace, interests, and capabilities of each particular student and contextualize learning in engaging virtual environments” (Honey & Hilton, 2011). The authors also echoed previous research demonstrating the appeal and engagement of learning games, and indicate that games can help support new inquiry-based approaches to science instruction by providing virtual laboratories or field learning experiences that overcome practical constraints. Lane Software explains, “For us, with Making History3, it was a matter of having a product that was deep and narrow and was only needed for content that was covered for one week of the curriculum” (CS4Ed interview, February 2012). In our interview, Scott Traylor, CEO and founder of 360KID, argued that long-form games can more easily fit into the homework side of the equation and that class time can be reserved for discussing results of the homework activities, strategies, and content learned (CS4Ed interview, March 2012). This “flipped classroom” model addresses the classroom time factor in that teachers can control how much time is spent on discussion sessions. However, there remain challenges with connectivity for students from lower-income households. As more schools experiment with various forms of online and blended learning, a better fit between available class time and long-form games may emerge. ON DEFINING GAMES: WHAT QUALIFIES AS EDUCATIONAL? The language of gaming and learning games is still in flux, and there has been little agreement between experts in the field about what falls under the category of “learning game” and what is not a game, but has “game-like” elements. Not surprisingly, the literature of games contains no agreed upon definition of a learning game. When we asked our interviewees what they considered a game, we found no consensus. One extreme cited any “formative assessment based on an adaptive engine,” while the other cited products with aspects of game mechanics such as badges, rewards, and points. Although the Software and Information Industry Association (SIIA) Codie awards category is for “Games and Simulations” (and researchers are sometimes careful to distinguish between simulations and games), for the purposes of this report we have included simulations in our broad definition of learning games. Such a wide range of products is confusing to the K-12 audience, because “games” can vary from products that are prototypical to ones that only leverage somewhat extraneous game mechanics to engage and to motivate. Confusion among types of games is of particular concern when examining the research evidence of the effectiveness of games in learning. Most university-based research evaluates learning games in environments that engage students for several weeks with immersive, challenging experiences. Thus, when researchers argue that learning games are efficacious, promote critical thinking, and engage 21st century skills, it is not necessarily clear that these conclusions apply to many shorter forms of learning games. All games have game mechanics that are the central element of the game and, to some degree, are integrated with the learning content. As James Gee argues in his keynote at the 2012 Games for Change conference, the extent to which the mechanics of creating motivation and directing attention is intrinsic to the content of the game can greatly influence learning outcomes. Gamification is the use of game-based elements or game mechanics to drive user engagement and actions in non-game contexts. In gamification, the game mechanics are divorced from the content being taught and are instead added in the form of some sort of reward element after completion of an activity. For example, a short-form math game that involves answering math questions where correct answers are followed by a badge or the reward of playing a “dunk the clown” game would be called gamification. David Dockterman, Ed.D., Chief Architect, Learning Sciences with Tom Snyder Productions/Scholastic is concerned about this use of game mechanics, stating “Gamification can begin to undermine a kid’s desire to learn” (CS4Ed interview, March, 2012). an expanding base of research that shows the effectiveness of long-form games in learning.